Yahoo says the experiment may not lead to a "lasting relationship"
Yahoo and Google, the world's two biggest search engines, have announced a two-week experiment that will see them share advertising space. During the pilot, Google will be able to place ads alongside 3% of search results on Yahoo's website. Analysts say the move is designed to frustrate Microsoft, which has offered to buy Yahoo for $44.6bn (£22.6bn), or extract a higher offer. The news came as both sides were reported to be forging other alliances. Microsoft and News Corp are discussing making a joint bid for Yahoo, according to the New York Times. The idea would be to combine three of the world's most visited websites: MySpace, Yahoo and MSN.com. News Corp had previously discussed working with Yahoo to see off Microsoft's offer. 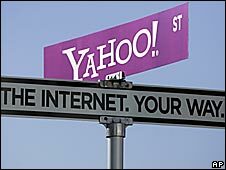 At the same time, Yahoo is looking to Time Warner's AOL to keep out of Microsoft's hands, according to the Wall Street Journal. It reported that the deal would involve Time Warner making a cash investment for 20% of the merged firm, which Yahoo could then use to buy back shares. Microsoft criticised Yahoo's advertising trial with Google, saying any lasting deal would not be in the consumers' interests. "Any definitive agreement between Yahoo and Google would consolidate over 90% of the search advertising market in Google's hands. This would make the market far less competitive," Brad Smith, Microsoft's General Counsel said. But Yahoo said the testing did not necessarily mean that "any further commercial relationship with Google will result". Investors reacted positively to the announcement, with Yahoo shares rising 7%. "Yahoo has made a really clever move here," Cowen and Co analyst Jim Friedland said. "It looked like Microsoft had all the cards, Yahoo is at least now able to use this for leverage to get Microsoft to pay more," he said. Microsoft chief executive Steve Ballmer on Saturday gave Yahoo three weeks to agree to the company's offer or risk having the offer lowered.